(Boston, MA) This summer, the Museum of Science will feature (in addition to their everyday offerings) a series of adult entertainments. Thursday nights under the dome of the Charles Hayden Planetarium, grown ups of Boston will be treated to live music, pub quizzes, movie screenings, and improvised comedy. 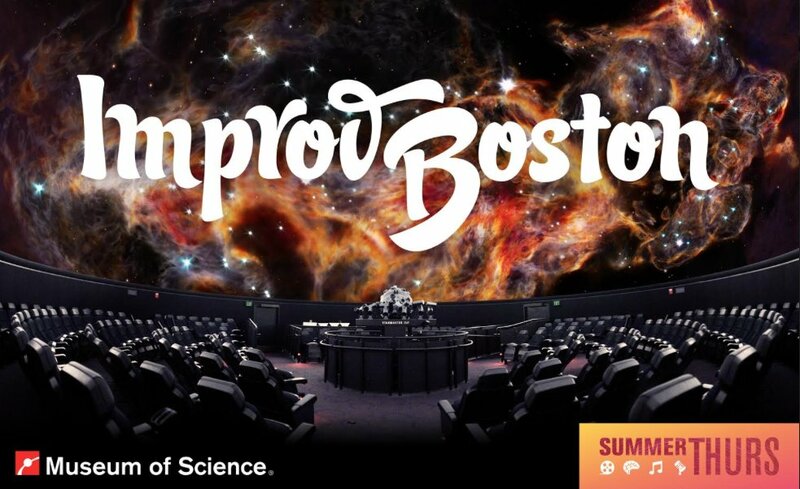 Last night was the first Thursday that ImprovBoston was featured at Hayden planetarium, doing their thing with live comedy improv (with a science twist, of course). ImprovBoston embraced the change of venue from their normal Cambridge blackbox, and used the planetarium dome to great effect. Projections including images, movie clips, colors, and a strange looming bust of Steve Buscemi. The artists at ImprovBoston displayed an intense amount of creativity when thinking about how best to use the Planetarium space (a feat not easily achieved since it’s in the round, and the largest central location is occupied by the museum’s giant star-projector). For that, there were definitely a few kinks in the programming that need to be worked out. Live improv is such a fickle art; there’s a very fine line between a bit landing and a bit sinking. Between the change of venue, first-show jitters, and unfamiliar technological integration, I think the performers had a rough time walking that line. Some pieces were spot-on hilarious; the show’s opener (an improvised narrative of the stars as your typical planetarium projections lazily floated past you through the sky) was just such a lazzi. The actors were on-point and ready to go, energize and flowing. Unfortunately, other bits stalled out and went on too long while still others were cut short before they really had a chance to flourish. It felt, at times, like I was watching a bunch of high schoolers participate in improv games: lots of enthusiasm, but without a finely tuned sense of what the audience was or was not plugged into. When the improv artists laugh harder at their own jokes than the assembled spectators, you know there’s a problem. I don’t think these issues are necessarily show-ruiners, but rather things that ImprovBoston might address in rehearsal before their show next month. The piece was a pithy one-hour long, which I think honestly was part of the trouble. Fitting so many pieces of improvised comedy into this time slot seemed to require a great deal of finesse and timing sensitivity, something that these artists will hopefully curate as they become used to the format of the evening. Despite these growing pains, the show was well worth the trip to be witness to the ensuing shenanigans. I applaud the Museum of Science for their innovative approach to using the space (I’ve already purchased tickets to at least two more summer Thursday events), and I still had an emphatically fun night out. It’s wonderful to see spaces, particularly spaces traditionally associated with STEM learning, embrace the arts as a collaborative practice that could benefit their patrons and their institution. What a great way to spend a hot summer night, definitely check out the MoS’s summer Thursday offerings. I think you’ll be thrilled with what you see. This entry was posted in Comedy, Improv and tagged 2017, Boston, Cambridge, Charles Hayden Planetarium, Danielle Rosvally-Fenton, improv, ImprovBoston, lazzi, MA, Museum of Science, science, STEM, Thursdays by Danielle Rosvally. Bookmark the permalink.